Pure horror movies are not very high on my movie watching list. While I do enjoy a psychological thriller, the mutilation and gore just doesn’t do anything for me. This feeling flows into board games as well, but I decided to make an exception for the game we are previewing today. 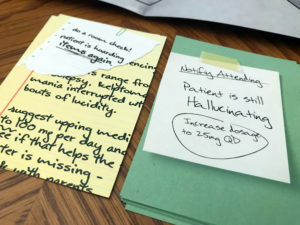 Coma Ward is in the same vein as Betrayal at the House on the Hill, but takes the location from a uniquely designed house to an abandoned hospital where supernatural things are happening. Players will start to piece the mystery behind their admittance to this hospital during the Prologue and when they have enough information, they are able to comprehend the Phenomenon that has caused this situation. Then they are tasked with finding their way out of the current situation. You don’t start the game with much besides the gown on your back, your starting stats, and mental instability to help you through. Heath and terror are your main two stat lines in the game and they determine your strength and dexterity (health) and focus (terror) levels during the game. Whenever you need to do a main action in the game, you will need to roll dice and hit the required number of successful results to take that action. One interesting wrinkle to the dice rolls that if you roll a 4, you not only reroll that die but also a new die. This gives you the chance to hit the required successes even if you don’t start with rolling enough dice. Item cards give you the chance to increase stats and protect you against attacks as you explore the hospital. You are not armed with stats alone, there is also something mentally wrong with you. Each player has a Neurosis and a Quirk that they will need to monitor during the game. Neurosis is a special set of goals and conditions that when met, will activate an ability. These can be positive or negative so you need to monitor your terror level to keep them in check. Quirks allow players to be better prepared to face the Phenomenon phase of the game. The first part of the game, the Prologue, is mostly about exploring the hospital that the players occupy. They will move around the different levels and start to reveal tiles that might be normal patient rooms or special rooms that give bonuses or negative effects. 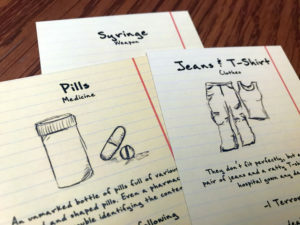 The main purpose for these rooms is to try to not only find useful items like clothing, medicine, and weapons but also clue cards that progress the story further. However, in order to find these items, you must make a focus check. If you happen to fail, you then draw from the hallucination deck. 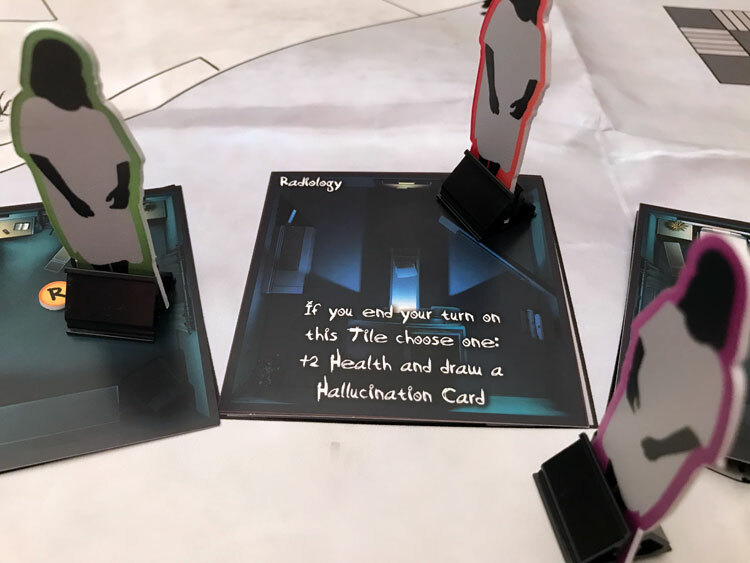 Another player will read the situation text and ask the player to choose their next action and find out the results of that choice. Exploration will continue until a player has discovered a third clue card from the item deck. At this point the Prologue ends and the Phenomenon can begin. Players will find which envelope to open and read the instructions from it. Players will then find out what they are up against and the new rules that apply. This may have all players working together or for themselves with hidden win conditions. It won’t be easy, with creatures and spectators making their way into the game forcing the players to fight to stay alive. 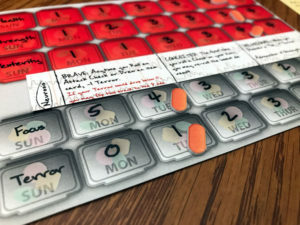 Once a player(s) have achieved the winning condition, the game ends and you read the epilogue card to see how the story ends. Different tiles have special effects that can help players improve stats, but normally have a chance to do some harm. If you think Coma Ward plays a lot like Betrayal at the House on the Hill, you would be correct. They both have similar mechanics in terms of actions you can do and the two segments of the game. Where the Coma Ward differs, in a good way, is it leaves behind the more campy horror of Betrayal for the more psychological. This is driven from the narrative from the hallucination cards that you occasionally draw. These paint a vivid picture of what is going on in that hospital that allows your mind to craft it. Even the back of cards do a nice job of developing the theme and immersing players. They also present choices for the players on how they want to proceed with the current situation. Players don’t fully know the outcome until after they have made their choice. This gives the players a taste of the unknown which fits well within the theme. My only issue is that I wish they were drawn more often. While the characters don’t have a back story, they do have two very interesting conditions from their Neurosis and Quirk. Both of these condition require players to pay attention throughout the game, as well as outside of it. The Neurosis gives specific bonuses, such as giving you an extra die roll. However, I found the Quirk cards to be more interesting. While the bonuses given are not amazing, I liked the process for earning them. They require actions from the actual players like standing up, getting food or scratching their head. Which are all things that you can try to have the players do during the game. This creates a second game to manipulate players to your bidding and I found it very fun. Keeping terror and heath stats high will help with all dice rolls, but that isn’t always easy. Unfortunately, I can’t say that the game avoided one of my biggest issues with Betrayal, that the second half experience can be a bit of a letdown. In one of the games I played, my wife happened to be in the room she needed to be in to end the game. Unfortunately, there isn’t a way to avoid this easily with a game of this nature. The last thing I wanted to mention was the dice rolling mechanic of 4 causing you to reroll that die and an extra one. 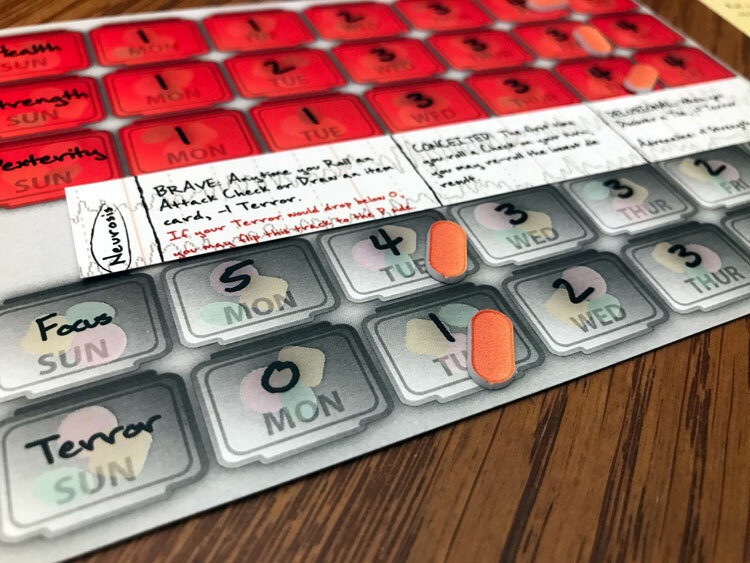 This clever mechanic allows players to at least have a chance each time they make a check during the game. Coma Ward is a more adult version of Betrayal that brings in a more interesting location than an old house. The mechanics are nothing groundbreaking, but add enough with a suspenseful dice mechanic and mental conditions that makes the game feel fresh. The true star of the game is the narrative that is woven throughout the game. While I was only able to experience one scenario, the experience make me want to play the game again to see what else the designers have in store. 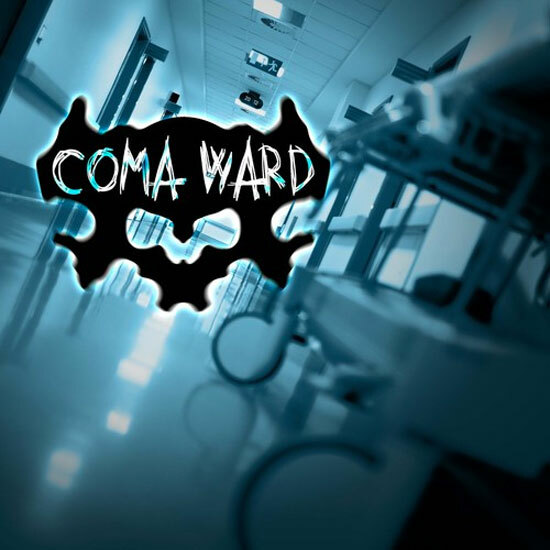 Coma Ward is now in funding so head over to their campaign page if you’d like some more info or to consider backing.